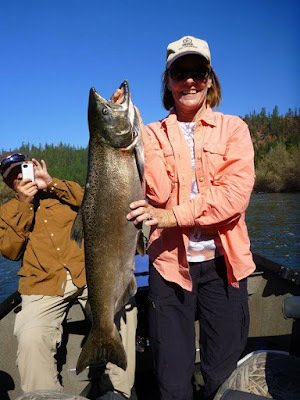 Klamath River Salmon Fishing is about to get started and we are gearing up for the fall festivities. I would like to show some appreciation to my existing customers and offer a drag screaming deal. I have 9 salmon dates and 3 steelhead dates left to fill and if you book now and help me fill those remaining dates I will give you a $100.00 discount on a 2 person fishing adventure. Thats right an all inclusive salmon or steelhead trip on the Klamath River for $300.00 dollars. The salmon dates I have left to book are: 9/21, 9/22, 9/23, 9/24, 9/25, 9/26, 9/27, 10/04, and 10/05.The steelhead dates I have left to book are: 10/22, 10/23, and 10/28.